Many who practice or study yoga are often enticed by the idea of traveling to study yoga in India. Why India? Because this is the land where yoga was born over 5000 years ago. India is an ancient land with a vast and rich cultural heritage. It has given humanity some priceless gifts, including the sister sciences of yoga and Ayurveda. Today, both disciplines are practiced by millions all over the globe. Yoga is 5000 years old, and India existed even before that. It is an ancient land. For those who come from countries that are a few hundred years old, it will be like stepping back in time. You will see buildings, temples and monuments that are thousands of years old; next to it you might see a shiny skyscraper. It is a heady mix of old and new. India is changing and growing at a rapid pace. Depending on which part of India you decide to travel to, the experience will differ. Also, know that India is multi-lingual, immensely diverse and no two regions are alike. India is crowded, very crowded. It is the second most populated country in the world, and for those unprepared for the sheer volume of people, the crowded cities can be overwhelming. Traffic rules are often ignored, drivers honk for no apparent reason and the driving itself can be terrifyingly ‘close.’ The cities are often dirty and polluted. A note for women travelers: Remember that most foreigners appear exotic to the average Indian eye. There is a good chance you will be stared at constantly or someone may rub past you. Though traditional Indian men are relatively shy, some may try to become friends with you. My advice: choose who you become friendly with wisely and always carry pepper spray when traveling alone. You know the old phrase “When in Rome.” A part of traveling is the experience of the culture. And sometimes, it’s not easily apparent and won’t be found in your guidebook. A few Indian cultural basics: respect your elders, respect your teachers, dress appropriately, behave modestly, work hard, be kind, be satisfied with what you have and thank God for your well-being. Wherever you land in India, try to learn what the silent rules are. For example, do not wear footwear in someone’s home or a temple, women ideally shouldn’t enter sacred places while on their menstrual cycles, you won’t see much PDA between lovers and we dress relatively conservatively. Does India have some of the world’s best traditional yoga schools? Of course! But there are also some bad ones — so don’t be fooled. I strongly advise you to look carefully for a reputed school or teacher. Try to find alumni or other resources that will help you find a great school. Many parts of India are still not technologically savvy and not all yoga schools have great websites. That is part of the magic; take your time, do your research. Be patient, and you will find your path. Also, the Guru shishya parampara (teacher-disciple dynamics) are very different in India. The teacher is a very revered and respected person. Your yoga journey in India will be enriching and rewarding. I urge you to judge less and learn more; to surrender and let this ancient land show you all that it has to offer. Even in all the chaos, crowds and heat, India is beautiful. The people are warm and hospitable and the spiritual wisdom and knowledge is unparalleled. Do not go to India expecting to know what you will find. Have no expectations and let her surprise you. My best wishes to all who embark on this wonderful journey. 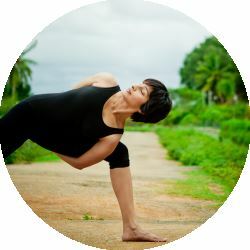 Have you traveled to study yoga in India? Share with us your experience in the comments section below.